As most sketchers eventually discover, one’s color palette is a very personal thing. Like a favorite pen, paper or bag, which are very specific to the way we draw, the other media we use, whether we sit or stand, and other personal habits, the colors we use most often depend entirely on our preferred subject matter and – even more idiosyncratic – how we perceive hues. One’s palette is something that gets refined over time. In addition, my palette tends to change seasonally and, if I’m traveling, with the location. That said, as is obvious from all the many paint and colored pencil sets available to buy off the shelf, it helps to have a set to start with. 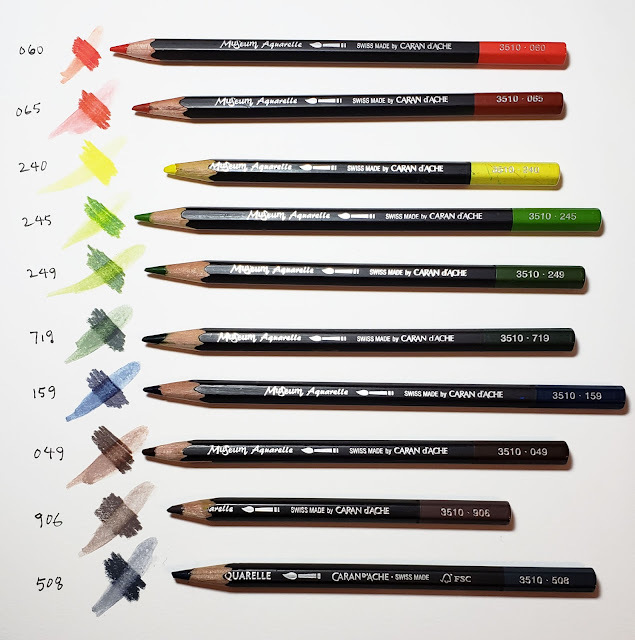 The problem I’ve discovered is that most basic sets of 12 colored pencils are not the 12 I use most. Last year I gave a deep think about how many colored pencils a person really needs and which 12 (or 25) would be in my ideal set. Not surprisingly, that ideal set has already changed for me! And so it goes. 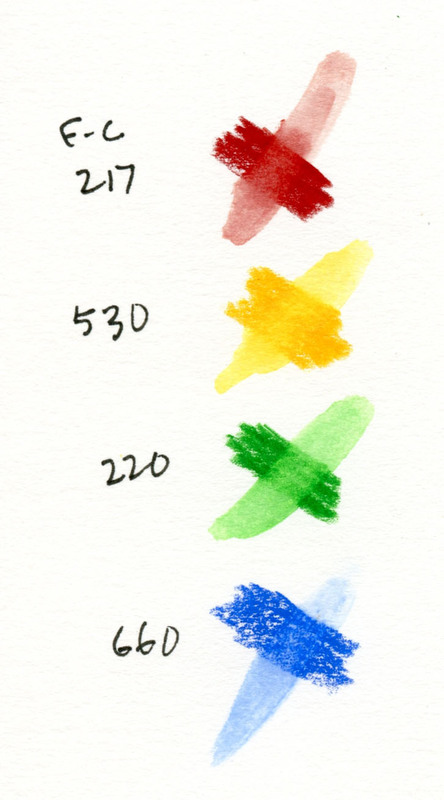 Recently two sketchers asked me for the color numbers of what I consider my basic Caran d’Ache Museum Aquarelle palette, and it occurred to me that while I listed the hues I picked out for Portugal last summer, it’s been a while since I showed my basic palette. Faber Castell’s Middle Cadmium Red (217): The only non-Caran d’Ache color in my current palette, this dark, subdued red is not available in Caran d’Ache’s line, but I like it for brick buildings. Gold cadmium yellow (530): This is my “heavy equipment yellow,” and I can’t leave the house without it. Green (220): This unnatural shade of green is ideal for recycle bins and Seattle street signs. Blue (660): This is the blue I use for the sky with my “licking” technique (please see my demo before you gag at that description). One thing I appreciate about Caran d’Ache is that all of its pigment hues are consistent across various product lines. 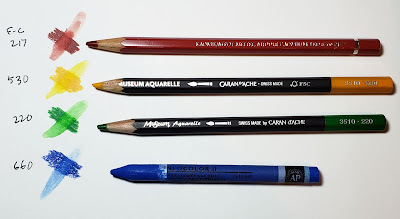 Up until recently, I had been using 660 in a Museum Aquarelle pencil, but I switched to the same hue in the Neocolor II line, which is Caran d’Ache’s water-soluble crayon collection. 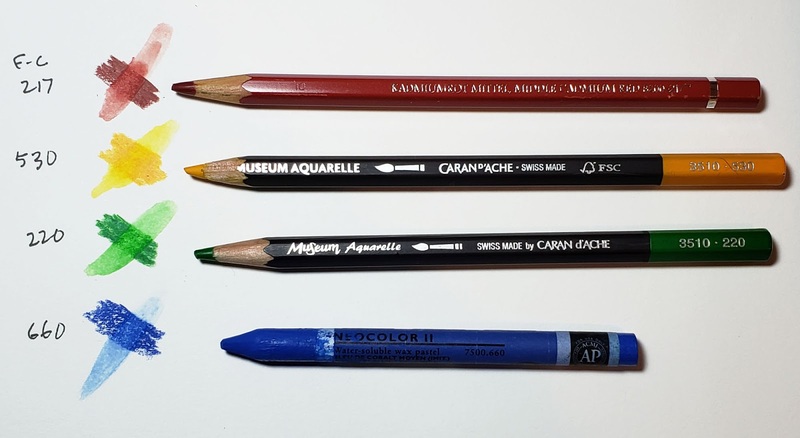 The hue is identical, but I find it faster to lick a rich swipe of pigment from the crayon than from a pencil tip. I consider this blue somewhat idiosyncratic because in its dry state, it looks way too dark for the sky, but when “licked,” it dilutes significantly. Since the photos above didn’t reproduce the colors as accurately, I’ve also included scanned images below. I love that you don't leave the house without your "heavy equipment" yellow. lol I can see your point for the water-soluble crayon rather than the pencil for your licking technique...more surface area to touch with the brush.